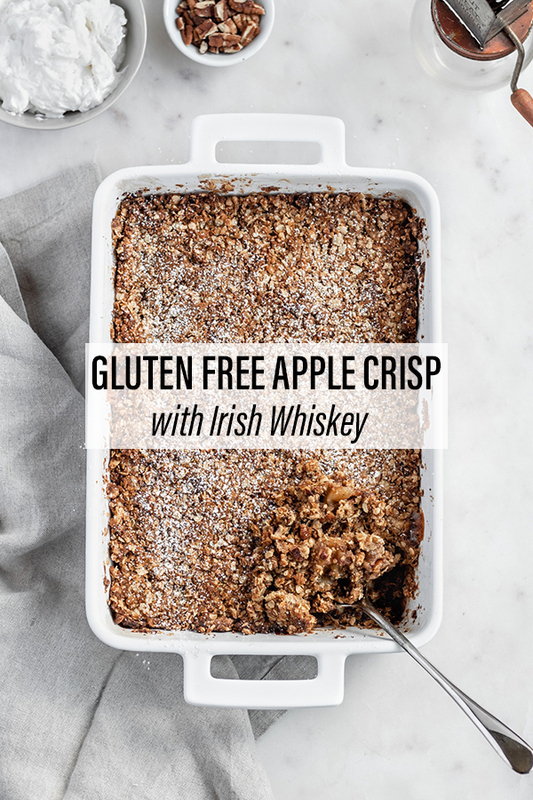 Gluten free apple crisp with a nutty, oaty topping and a splash of Irish whiskey for depth. 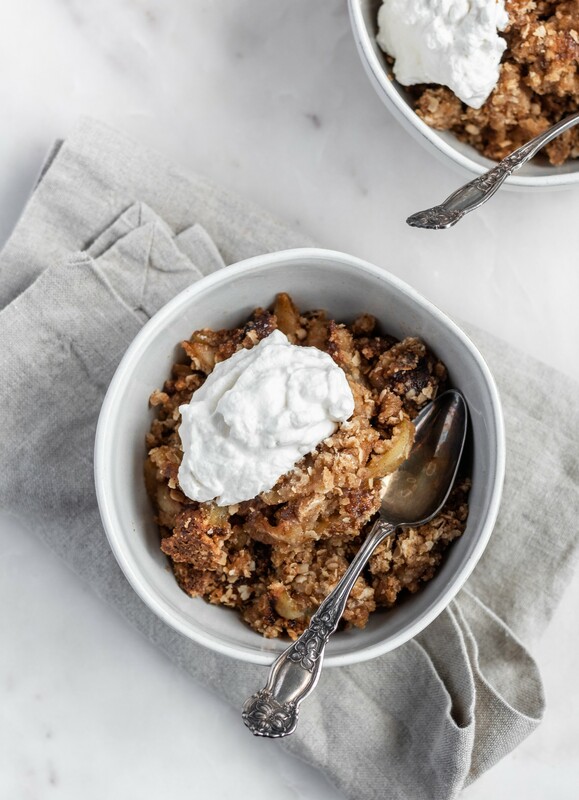 This recipe is easily adaptable and only takes about 15 minutes to throw together! Oh heyyyy, how was everyone’s St. Paddy’s Day?? Mine ended up being kind of really amazing even though I had absolutely no plans to celebrate whatsoever. But really aren’t those the nights that end up being the best? Marc and I had just gotten off of a plane from Vegas, and there was no way we were about to cook. So, we went to one of our favorite Thai restaurants and ate all the pad see ew and Panang curry. After, we decided to stop in a little Irish pub for a quick beer. Luckily, everyone celebrated at the Leprechaun bar crawl the night before, so it wasn’t even that crowded. And we drank Smithwick’s because I don’t want to be that person, but a traditional Guinness is really just better in Ireland. Don’t hate me for being too hipster about this, I’m sorryyyy. Anyways, they had cleared out all of the tables, which meant we had to stand and perch our beers on a ledge along the wall in true Irish fashion. There was a traditional Irish folk band playing, and I swear, I felt like I was in Belfast again. They didn’t play Galway Girl, my favorite folk jam, but they were so good I didn’t even care. And I wore my favorite green shirt, which isn’t unusual because I wear it on the weekly. But I was still excited about my festive-ness. Anyways, this wasn’t even my first St. Patrick’s Day celebration, because I actually celebrated at a family dinner the weekend before. My mom and I made a ton of corned beef with cabbage, potatoes, and carrots. Obviously, we had beer bread. 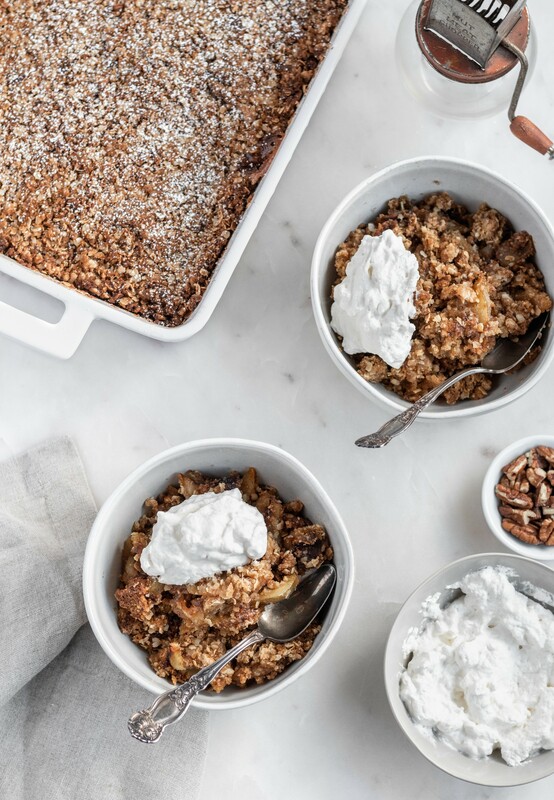 And I made gluten free apple crisp, one of the best Irish desserts!! 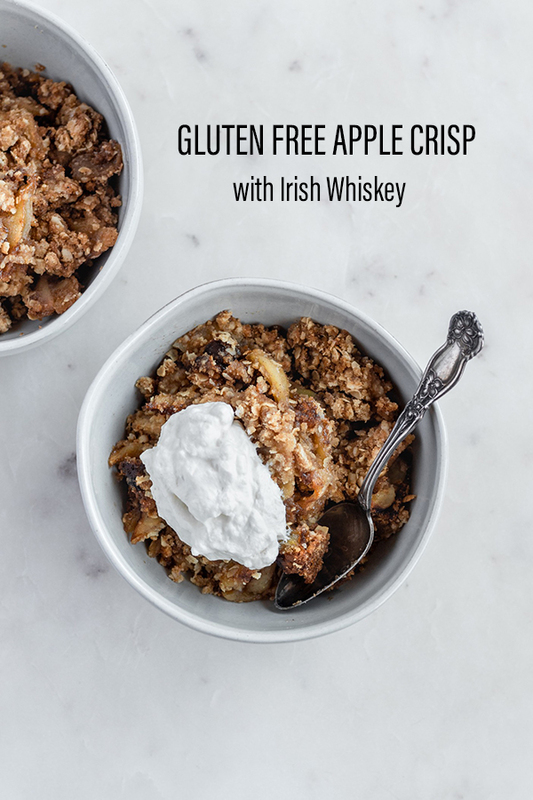 I know it’s not St. Patrick’s Day anymore, so adding Irish whiskey to this gluten free apple crisp probably doesn’t make sense. But I decided I should probably stop adding bourbon to everything. I don’t know that it’s getting old, I just think maybe I’m doing it too much. And what am I supposed to do, just not add whiskey to every dessert? It’s like you don’t know me at all. I’m actually glad I threw some Irish whiskey in there because unlike most American whiskeys, Irish whiskey has a pretty mellow flavor. 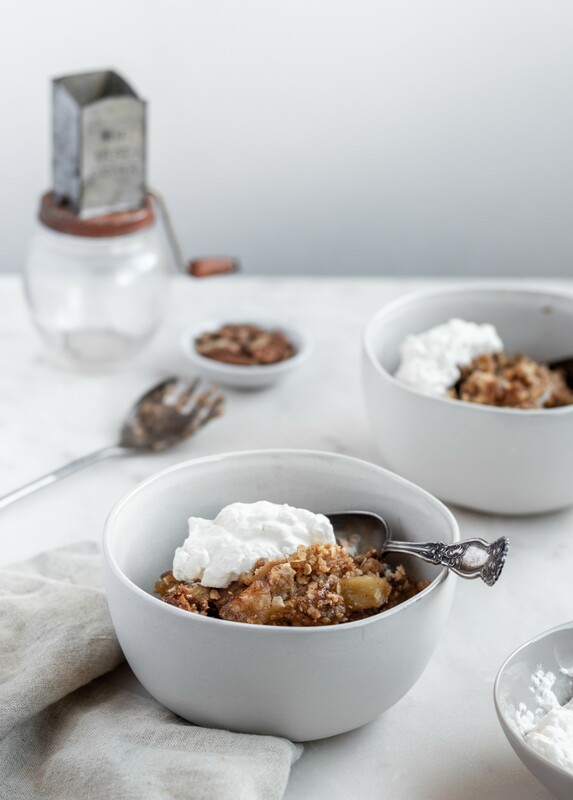 I made this apple crisp for a crowd of whiskey-lovers and non-whiskey lovers alike. And it ended up being a pretty solid balance that pleased everyone. Also, we have both gluten and nut allergies in this family, so I made both a gluten-free version and a gluten-free-and-nut-free version. However, you can totally add nuts, not add nuts, leave out the whiskey, or use regular AP flour instead of gluten free flour. 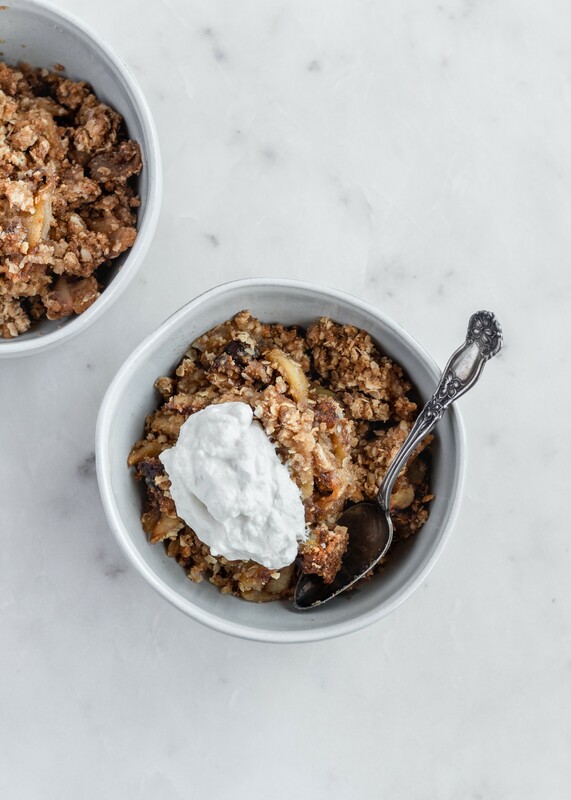 This recipe is stupidly adaptable and insanely easy. Enjoy!! 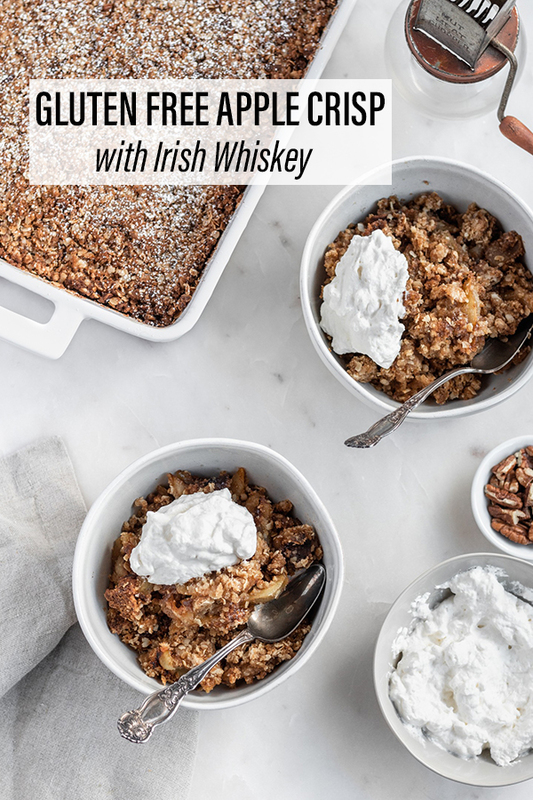 This recipe is super adaptable, so feel free to sub the whiskey for another liquor or leave it out entirely. The gluten free flour can be subbed for regular AP flour, and other kinds of nuts can be used instead of pecans. Basically, no matter what you do, you can't mess it up! Lastly, this recipe can easily be halved for a smaller group of people. Preheat the oven to 350* F. Brush some melted butter on the bottom and sides of a 9x13 pan. Set aside. 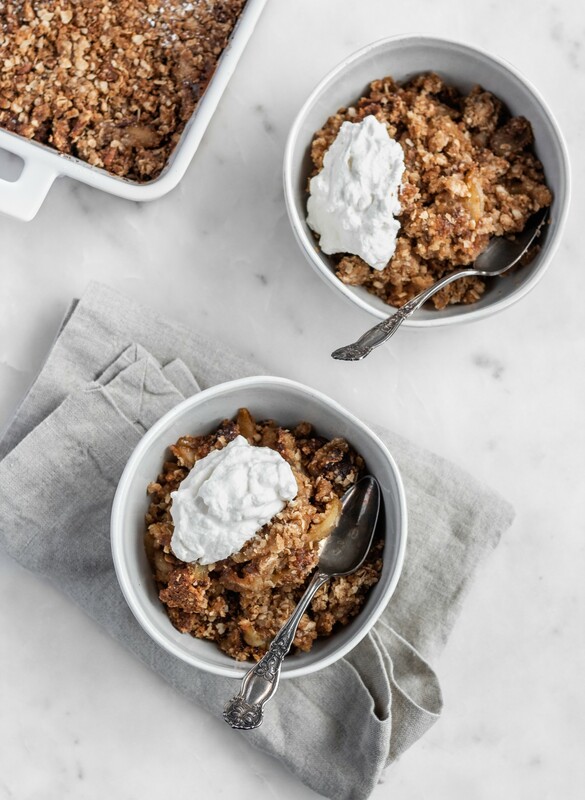 In a medium bowl, stir together the sliced apples, sugar, gluten free flour, Irish whiskey, vanilla extract, cinnamon, cardamom, and nutmeg. Spread evenly into the 9x13 pan. Set aside. 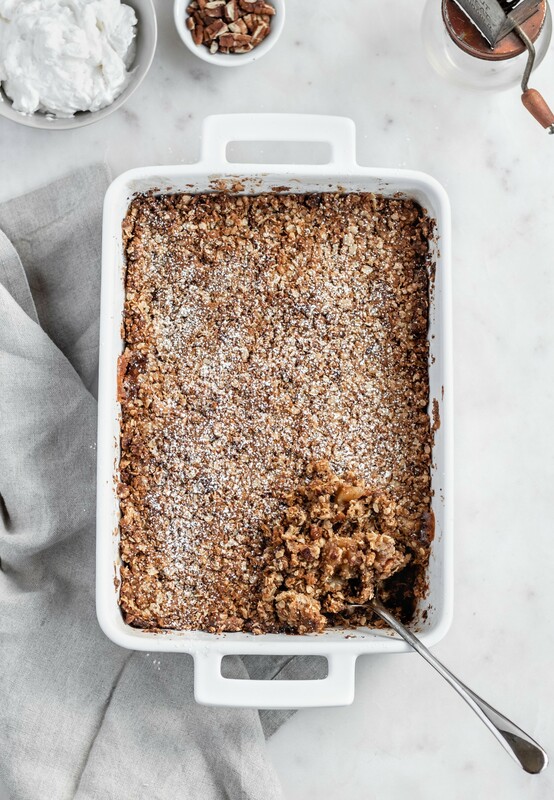 In a small bowl, whisk together the oats, gluten free flour, and brown sugar. Drizzle the butter over the top and mix until crumbly. Stir in the pecans and a pinch of salt. Spread evenly over the apples.